We’d love your help. Let us know what’s wrong with this preview of On War by Carl von Clausewitz. To ask other readers questions about On War, please sign up. https://archive.org/details/hamlaenglish_gmail_20180318_2118 الكتاب مترجم للعربية ? Reviewing classics can be humbling. Some books have passed through so many generations and have been analyzed so thoroughly that they've reached mythic proportions. Only the arrogant or ignorant would criticize them. On War is just such a book. First the disclaimer. I have an amateur interest in military history but do not have the depth to fully appreciate mid-19th century military theory. Regardless, I know enough to appreciate Clausewitz's rejection of formulated tactics and movement. Now for Reviewing classics can be humbling. Some books have passed through so many generations and have been analyzed so thoroughly that they've reached mythic proportions. Only the arrogant or ignorant would criticize them. On War is just such a book. Now for the arrogant and ignorant part. Activity in war is movement in a resistant medium. Just as a man immersed in water is unable to perform with ease and regularity the most natural and simplest movement, that of walking, so in war, with ordinary powers, one cannot keep even the line of mediocrity. This is the reason that the correct theorist is like a swimming master, who teaches on dry land movements which are required in the water, which must appear grotesque and ludicrous to those who forget about the water. This is also why theorists, who have never plunged in themselves, or who cannot deduce any generalities from their experience, are unpractical and even absurd, because they only teach what everyone knows- how to walk. pg. 67-68. Even though Clausewitz's speaks to the uselessness of theorists expounding well-understood concepts, slightly reworded to sound insightful, he does the same. For example: "The only means of destroying the enemy's armed force is by combat, but this may be done in two ways: 1) directly, 2) indirectly, through a combination of combats." Pg. 325 or "The best strategy is always to be very strong, first generally then at the decisive point." pg. 175. Granted, any book can be dissected and sentences taken out of context to give absurd impressions. However, these types of assertions are presented at frustratingly tiring length and repetitiously. Again, to be fair, Clausewitz was a soldier, not a writer. But precisely because of that, I expected Clausewitz to present his ideas with greater clarity and precision. Clausewitz's devotion to articulating simple points may be a rejection of the esoteric theorists of his time. He places great importance on plain meaning. Thus it has come to pass that our theoretical and critical books instead of being straightforward, intelligible dissertations, in which the author always knows knows at least what he says and the reader what he reads, are brimful of these technical terms, which form dark points of interference where author and reader part company. But frequently they are something worse, being nothing but hollow shells without any kernel. The author himself has no clear perception of what he means, contents himself with vague ideas, which if expressed in plain language would be unsatisfactory even to himself. pg. 129. The "hollow kernels" he rejects in the language of others unfortunately feels similar in his own writing. Simple ideas excessively elaborated upon to chapter long expositions don't make them any more insightful. But On War is a classic for a reason. His core ideas, which have given the work its timeless nature, display his modern savviness. Clausewitz, a career soldier, surprisingly supports the subordination of pure military campaign planning to the judgments of political (though martially competent) statesmen. He portrays the military machine as a political tool. The objectives of any combat are either total annihilation of the opponent's fighting force, or more realistically, fighting will. His chapters on defensive combat and protracted campaigns resonate well in the post-Vietnam era as well the current era of fighting ideological groups which may not be defined in geo-political terms. Now, if anyone wonders at finding nothing here about turning rivers, about commanding mountains from their highest points, about avoiding strong positions, and finding the keys of a country, he has not understood us, neither does he as yet understand war in general in its general relations according to our views.pg. 373. Stochastic efforts such as war require fluidity and brilliance that Clausewitz places front and center. The "moral force" of an army is given considerable discussion as is its leader's character. The combination of cleverness and courage is given considerable importance "(a)s we admire presence of mind in a pithy answer to anything said unexpectedly, so we admire it in a ready expedient on sudden danger." pg. 45. Clausewitz recognizes that maintenance of intellectual acuity distinguishes the leader from the "...subordinate general grown grey in the service, and in whom constant discharge of routine duties has produced a decided poverty of mind, as a man of failing intellect, and, with all respect for his bravery, to laugh at his simplicity." pg. 57. On War has been a military studies staple for generations. Its impact cannot be ignored. But, frankly, the book suffers stylistically and most of the pages are filled with repetitions of straightforward concepts. For the modern reader, who may not be reading it for its pure historical significance, On War (much like this review) is more tedious than enlightening. "War is simply the continuation of politics by other means." Far too many people quote Clausewitz without read him, but after reading this edition of On War, there is no excuse not to read Clausewitz, and perhaps understand him. I will speak first to the translation: This is how it should be done. Howard, Paret, and Brodie produce an accurate and highly readable text, with invaluable supplementary essays on the historical impact of Clausewitz and his key points. Accept no other translations. Secon "War is simply the continuation of politics by other means." Second, the text itself. I'm a war nerd, and this is one of the best books on strategy that I've read. Compared to The Art of War or Liddell Hart's Strategy, Clausewitz is clear and direct. War is violence used to disarm and enemy and compel him to your will. The best way to achieve this end is to concentrate your forces and destroy the enemy in a decisive battle. But this reading is also simplistic and unfair. Clausewitz has the utmost respect for friction, uncertainty and confusion in war, and the impact of psychological and political factors. He does not advocate for war, merely for clarity in the process of conducting a war. If there is one aphorism that is not in the text but should be, it is "The object of war is to secure a better peace." If more political leaders had a conception of the better peace they aimed at, and the cost and limitations of military means in securing that end, we would have a safer and more secure world. Almost 200 years later, this masterpiece is still misunderstood and ignored. Clausewitz argues that the purpose of war is to disarm your opponent and thereby force him to give you want you want. Based on this premise, he concludes that wars are essentially unwinnable on the battlefield: it is virtually impossible to completely disarm your opponent through might alone. Instead, your opponent at some point has to decide to give you want you want--and getting your opponent to come to that decision m Almost 200 years later, this masterpiece is still misunderstood and ignored. No one can actually enjoy reading Clausewitz - it simply must be done. One of the most difficult books I've ever read (so far). Took me a month just to read it, and sadly not 100% able to understand the whole thing. This one needs a re-read someday. Some parts are just so indigestible and make me want to pull my hair due to frustration. Having said that, why I gave this book four stars? Well, first it is a challenging read and I like challenges. Secondly, the contents are unbelievable. Yes, some explanations may be outdated, but the gist is still relevant. If one co One of the most difficult books I've ever read (so far). Took me a month just to read it, and sadly not 100% able to understand the whole thing. This one needs a re-read someday. Some parts are just so indigestible and make me want to pull my hair due to frustration. Having said that, why I gave this book four stars? Well, first it is a challenging read and I like challenges. Secondly, the contents are unbelievable. Yes, some explanations may be outdated, but the gist is still relevant. If one could get pass through the Book I-II of this book, then he/she is able to continue, that's my guarantee. Book III is where the fun starts, down right to the end. The examples taken from the Napoleonic and Prussian wars were quite helpful. Strategies, combats, relation of power, defense vs offense and plan of war, a military enthusiast should make this book his/her bible. Or even politicians, yes, they are obliged to read this book. Besides, as Clausewitz pointed out, the only source of war is politics. I will not make a thorough review due to my need to re-read this enigmatic book to have a full grasp on its notions and philosophies (which are many). 1) Why don't nations fight wars of annihilation (remember, this is the early 19th Century, he doesn't know about the World Wars)? Well, why don't school children carry on their fights to the death? Answer: doing so isn't anywhere near worth the cost. Wars are fought by different nations over disagreements on policy; while that disagreement may be worth fighting over in their mind, it may not be worth risking national obliteration. The idea is to drive up the cost of war (deaths, wounded, money, political support) for the enemy higher than the worth of the thing being fought over is to them. What that thing is worth will be different for the different parties. While Clausewitz doesn't focus much on this, or at least not clearly, this asymmetric valuation is of extreme importance. The United States inflicted far more damage on our Vietnamese enemies than they did on us, but the value of victory for them approached infinity whereas most in the United States had only so much patience for supporting a corrupt regime in some country most couldn't find on a map. If both sides see victory as worth any cost, we get closer to the "pure theory of war", which is a bad thing. 2) The concept of friction. Pushing flags on a board: easy. Getting the 10,000 men that flag represents to the actual location indicated on the board in the face of enemy opposition, incomplete knowledge of roads and terrain, and feeding them all: not so easy. The more complex the plan, the more opportunities there are for something to go wrong. I found these ideas, along with most of Clausewitz's theory, were better illustrated in Shelby Foote's The Civil War. Clausewitz himself is at his best when using historical examples to show his ideas in action, rather than pondering about "theory" and it's relation to practice and whether war is a science or art. Lo que nos cuenta. Análisis teórico sobre la guerra basado en el pensamiento del autor, su experiencia y su tiempo, desde su propio concepto hasta la generalidad de sus planes operativos, pasando por las fuerzas armadas, el combate y la teoría estratégica. Publicado de manera póstuma, menos de un año después del fallecimiento del autor, con sólo el primer libro, de los ocho que lo componen, revisado por Clausewitz y los siguientes en mayor o menor grado de finalización editorial. The imposing and tangled manuscript meant to become a comprehensive theory on war and its praxis. Le manuscrit intimidant et broussailleux qui devait servir à une théorie générale de la guerre. This is the classic work of military strategy, written by a Prussian general in the nineteenth century, which has been often discussed but little understood. It is often held up as the ultimate example of “Prussianism,” of stifling military correctness, or as the champion of “absolute war” and the use of brutality and abandonment of rules in order to annihilate the enemy. It is blamed for the outbreak of both World Wars and for the horrors which those and subsequent conflicts loosed on the world This is the classic work of military strategy, written by a Prussian general in the nineteenth century, which has been often discussed but little understood. It is often held up as the ultimate example of “Prussianism,” of stifling military correctness, or as the champion of “absolute war” and the use of brutality and abandonment of rules in order to annihilate the enemy. It is blamed for the outbreak of both World Wars and for the horrors which those and subsequent conflicts loosed on the world. What we really have here is an unfinished text, since Clausewitz died before he could complete it, and I suspect that the complete version would have actually been shorter, as he cut out repetition and some of the less relevant digressions. Still, there is plenty here to chew on, and more than enough to disprove most of the above assertions. Clausewitz is, of course, both Prussian and a military man, and his subject is war, but he is not uncompassionate. In fact, he takes into consideration the difficulties suffered by men in the field, not least because he has been one himself. He is aware that, at the time he was writing, disease was responsible for the loss of more soldiers than combat, and he does not advocate prolonged forced marches or other cruel methods. He is very much aware that the spirit of the men has an impact on the outcome of battle, and the terrible responsibility a commander has in making choices that will minimize the destruction and suffering of those under his command. He is also aware that vacillating and over-cautiousness can lead to worse catastrophes than boldness, in some circumstances. So far as “absolute war” goes, yes, he does use the term. But he doesn’t necessarily advocate it as a “better” way to fight. There are two reasons for his use of it. The first is theoretical, in line with the idealist philosophy predominant in his time, he tries to use an idealized picture of war as a theoretical basis, from which particulars can be derived and adapted to real world conditions. This may or may not be the best approach, but it is not a matter of preferring war in its absolute state. The other reason he speaks of it is that as a veteran of the Napoleonic Wars, he had witnessed the escalation of war much closer to its “absolute” state than had previously been considered possible. And he learned from Napoleon’s successes that where one side is willing to go to such an extreme while the other holds back, the more ruthless side will be at a distinct advantage. The other side is forced to adapt itself in order to survive. So far as his influence is concerned, there is no doubt that Alfred von Schlieffen, who planned the German attack that started World War One, had read Clausewitz. But, Schlieffen didn’t start the war by himself, and had he used some other source in his planning, it wouldn’t have made the war any pleasanter. Hitler never read anything as long as this book (he boasted that he could learn all he needed to know by reading just the beginning and end of any book), and wouldn’t have cared for a lot of what Clausewitz had to say anyway. The phrase that is best known from this book is translated here as “War is the continuation of policy by other means.” I have seen arguments that this translation misses the true meaning of this statement, and I can’t comment on that. It is true that Clausewitz also defines war as “an act of force to compel our enemy to do our will.” I have seen it argued that the earlier statement is meant as a dialectical antithesis to this one. If that is true either a) Clausewitz was a very poor dialectician or b) there is something wrong in the translation of both statements. They do not negate one another. One could easily synthesize them by stating that “war is a continuation of policy by means of force, in order to compel a foreign nation to do the will expressed by our nation’s policy.” No new concept arises from this. In all, the book is worthwhile, certainly from a historical standpoint, and maybe from a military science standpoint as well, but it is too long and too flawed to hold the interest of most readers. The best chapters are at the beginning and end of the book, while Books six and seven are the worst – book six because of too much repetition and book seven because of lack of analysis. The final chapters are where Clausewitz finally puts his theory to work by giving detailed historical analysis, and to me they would have been better if they had been placed earlier. This book stands as an important and modern classic about the nature of war. Clausewitz applies rigorous analysis to almost all the factors that influence war, not least of which are social and political aspects. Indeed, for him, war is part of man's social existence, and politics the womb in which war develops. This is encapsulated in his famous comment: "War is merely the continuation of policy by other means." There are a number of intriguing and developed insights within this book: how defens This book stands as an important and modern classic about the nature of war. Clausewitz applies rigorous analysis to almost all the factors that influence war, not least of which are social and political aspects. Indeed, for him, war is part of man's social existence, and politics the womb in which war develops. This is encapsulated in his famous comment: "War is merely the continuation of policy by other means." There are a number of intriguing and developed insights within this book: how defense is the stronger form of waging war, how military talent does not necessarily scale, how the object of attack is not fighting but possession, how strategy belongs to art and tactics to science, and so on. Five stars for the translation which is simply the best on the market, and includes a superb commentary by Bernard Brodie. This is my fourth time reading this in the context of a class (Naval War College) and it is not any easier to navigate or understand, however, it is never a waste of time. Clausewitz himself gives the best summary of this work on p. 89: "First, therefore, it is clear that war should never be thought of as something autonomous, but always as an instrument of policy; otherwise Five stars for the translation which is simply the best on the market, and includes a superb commentary by Bernard Brodie. This is my fourth time reading this in the context of a class (Naval War College) and it is not any easier to navigate or understand, however, it is never a waste of time. Clausewitz himself gives the best summary of this work on p. 89: "First, therefore, it is clear that war should never be thought of as something autonomous, but always as an instrument of policy; otherwise the entire history of war would contradict us. Only this approach will enable us to penetrate the problem intelligently. Second, this way of looking at it will show us how wars must vary with the nature of their motives and of the situations which give rise to them." The best tool that I have found to help navigate this work is "Who is Afraid of Carl Von Clausewitz: A Guide to the Perplexed" by Michael Handel, who used to teach here. His advice on reading Book 2, Chapter 2, "On the theory of war", provides a solid foundation before proceeding to the most important part of the book, which is Book 1, Chapter 1, "On the nature of war." This chapter should be read multiple times, because each reading gives new layers of understanding Clausewitz's underlying theory. Without doubt the best book about war ever written! Even after all this time (how long has it been since it was written? centuries!) it is not dated. Really, it is not dated. Carl Von Clausewitz is the first theorist of war (and he remains the best). Moreover, he is the first to write and understand war fully. There are other great books on this subject such as those written by Machiavelli and Sun Tzu but this is a theory, a great theory of war. Just like Sun Tzu and Machiavelli, the author creat Without doubt the best book about war ever written! Carl Von Clausewitz is the first theorist of war (and he remains the best). Moreover, he is the first to write and understand war fully. There are other great books on this subject such as those written by Machiavelli and Sun Tzu but this is a theory, a great theory of war. Just like Sun Tzu and Machiavelli, the author created something that can be applicable not just to a specific situation, but to life in general. Now, what are the down sides to this book? It is not easy to read, that fact probably couldn't be avoided due to its broadness. For most readers, it's going to be a tough read. Don't get discouraged, I for one didn’t find it as difficult as people say it is. To be honest, it wasn't that difficult at all, now when I think of it, I just needed a lot of time to read it. If you're not interested in the subject or you're not willing to put in some time (and maybe effort) into reading this one, skip it ...but alas you'll have to live with the fact that you've missed a great book. With the understanding of certain tactical level chapters being outdated, it is still a phenomenal read for strategic and operational theorizing, but must be consumed slowly, deliberately, and with much contemplation. Superficial hypocracy and seeming contradictions are eliminated with careful evaluation, intellectually Clausewitz reduces issues to their theoretical, most simplistic forms, and then walks them back with elaboration of the real world complications that prevent and contrive a perfe With the understanding of certain tactical level chapters being outdated, it is still a phenomenal read for strategic and operational theorizing, but must be consumed slowly, deliberately, and with much contemplation. Superficial hypocracy and seeming contradictions are eliminated with careful evaluation, intellectually Clausewitz reduces issues to their theoretical, most simplistic forms, and then walks them back with elaboration of the real world complications that prevent and contrive a perfect solution. I have the abridged Wordsworth Classics edition, abridged because the original consists of eight books in three volumes, and of course was written in German, so it's not a light read. On War is certainly one of the great books of military history. It is probably also one of the most dangerous, because his theories can, and have been, taken out of context and misused as justification for a range of sins in politics and warfare. My particular interest in On War at the moment is to refresh my memory of my original reading. I like Clausewitz's very logical and philosophical approach to the subject, coloured by his acerbic comments about other unidentified theorists (he annoyed a fair few other writers). It's an interesting blend of the supremely logical and the romantic, bearing in mind that he was a contemporary of Byron. كتب كلاوزيفيتس العديد من الكتابات في التاريخ العسكري والفلسفة والسياسة فضلا عن النظريات الحربية ويعد كتابة " عن الحرب " أحد أشهر اعماله وقد نشر بعد وفاته حيث امضى في كتابته في 12 عاما وقد أصبح مع مرور الوقت من أهم المراجع الكلاسيكية في الحرب وقد اشاد به كل من هتلر وايزنهاور وانجلز ولينين. 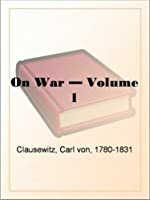 Ranked one of the great contributions in the literature of war, Clausewitz's book, "On War", presents a wide-ranging and very intellectual discussion of the subject of war. There is room for debate about precisely what the book is about. But Clausewitz is emphatic about what it is not: it is not a book on doctrine; it does not presume to give definitive tactical lessons; it does not pretend to give a formula on strategy-making. These are not Clausewitz's purpose. Rather it is theory that he say Ranked one of the great contributions in the literature of war, Clausewitz's book, "On War", presents a wide-ranging and very intellectual discussion of the subject of war. There is room for debate about precisely what the book is about. But Clausewitz is emphatic about what it is not: it is not a book on doctrine; it does not presume to give definitive tactical lessons; it does not pretend to give a formula on strategy-making. These are not Clausewitz's purpose. Rather it is theory that he says he is after. To use a formulation of Clausewitz: war is his subject, but theory is his object. This in a breath is the spirit of his book. There is a lot to say about "On War". Some in praise, some in criticism, but all interesting. Because the space of this entry need not wander on needlessly in length or purpose, the discussion here must be abridged. Therefore I will confine myself to mention of three main themes. First is Clausewitz's discussion of politics and warfare. Second is his use of historical figures, particularly Napoleon and Frederick II. And third, the self conscious aspect of Clausewitz's theory. The role of politics looms large in Clausewitz's theory of war. It is no coincidence Clausewitz and his book are known by the slogan "that war is nothing but the continuation of policy by other means." Though Clausewitz does not limit his theory of war to politics, his theory has become synonymous with the phrase. But Clausewitz is deliberate about identifying other influences on war. He proposes military genius, friction, and other intangible, psychic factors. Still for Clausewitz it is clear that politics has an influence on war that is predominant. Clausewitz goes out of his way in the preface to give the influence of politics specific highlight. That mention is followed right after by his dramatic first chapter, which exclusively discusses the importance of politics in war, and supplies its proof with an elaborate dialectical argument contrasting real and absolute war. This order of presentation should not be dismissed. The positioning of politics at a location foremost in the arrangement in his book has a special significance. By his own theory of war, Clausewitz advocates identifying the point of decision, and directing the main energy of the force against it. The same is apparent in his attention to argument. For Clausewitz, the influence of politics is the decisive point in his theory. Therefore he supplies it with his own main effort. The influence of moral qualities, military genius, danger, are important, but for Clausewitz they are really secondary actions. It is for this reason book 1 chapter 1 reads entirely different from every other chapter of the book. It has been combed and carefully organized in a way unmatched by any other chapter—this Clausewitz admits himself. It is also for this reason that he devotes all of book 8 to exploring the consequences of politics in his theory of war. Such disproportionate labor on the influence of politics, it is clear that Clausewitz’s intent is to impress the significance of this theme. If politics represents the major insight of the book, his use of historical personages, particularly Napoleon and Frederick, is an important second. Clausewitz does not make it an explicit point of his theory. Nevertheless the same opinions appear too often and too consistently to be dismissed as trivia meant for illustration. For Clausewitz, Napoleon and Frederick represent something more than relevant examples. Far more. The two famous generals typify exactly the qualities of failure and success in warfare that his theory means to explain. Put more dramatically: they are the very inspiration for the theory itself. Napoleon is given as example of the archetypal general who is seemingly the great military genius, but in fact is not. Though he may possess characteristics that bring great success in battle, despite his brilliance, his politics and his war strategy are not in harmony. Therefore, for all Napoleon's apparent success, as a true strategist and statesmen he must be judged a failure. On the other hand, conventional opinion has it that Frederick should not enjoy equal rank with Napoleon, Alexander, Caesar, or other military royalty, though he be regarded as great general nonetheless. But by Clausewitz's reckoning, Frederick is truly the superior of Napoleon; for though he did not conquer near all of Europe in the manner of Napoleon, he achieved a harmony between his politics and his war strategy that Napoleon never did. Judged in this way, though he fought for bare existence in the Seven Years War, Frederick can claim a legacy greater than that of Napoleon. This anyway is one of the important sub narratives in Clausewitz's book. On most occasions Clausewitz prefers to question Napoleon's command, asking whether he truly deserved credit for his victories. While in the case of Frederick there is absolutely no instance where Clausewitz does not cover him with flatteries. The difference in treatment is extreme. So different in fact, one could speculate darkly whether Napoleon and Frederick are meant to serve theory, or whether the theory is meant to serve the men. Though it would be unfair to dismiss Clausewitz with such cynical speculation; there is an important strain of historical revisionism in "On War", which if true, degrades the theory as a disguise for rationalizing Prussian superiority. This review is on the abridged Reclam edition of the text. It is hard to classify what type of book this is. What it is certainly not, is a textbook on military tactics. In its different parts, it contains a meta-analysis of war, aimed at dispelling many of the theoretical beliefs on war at the time, a psychological and sociological analysis of the countries in war, the military and its leaders, and it also contains a good deal of advice on large-scale military strategy. In all this, the text most This review is on the abridged Reclam edition of the text. كتاب عسكري ضخم، صب فيه كلاوزفيتز فلسفة "كانت" بالفكر العسكري فخرج هذا السفر الاستراتيجي. الكتاب رغم ضبابية بعض مفاهيمه وربما تصادمها إلا أنه يُعد الكتاب الإستراتيجي الأول. "On War" is one of those books that was at the same time amazingly influential and almost never actually read. While Clausewitz is quoted and discussed by military men repeatedly, it fascinates me how many military officers serve long and distinguished careers without ever having read this book. In many ways this is understandable. Clausewitz is very philosophical and abstract, to the point that many of his ideas are simply not applicable to everyday military planning. One must also remember tha "On War" is one of those books that was at the same time amazingly influential and almost never actually read. While Clausewitz is quoted and discussed by military men repeatedly, it fascinates me how many military officers serve long and distinguished careers without ever having read this book. In many ways this is understandable. Clausewitz is very philosophical and abstract, to the point that many of his ideas are simply not applicable to everyday military planning. One must also remember that, despite the frequency with which he is cited, Clausewitz was a radical and very much opposed to the thinking of military men in his own day, and certainly in ours. While Clausewitz wrote in the first half of the 19th Century, his thought never really came to be accepted in the armies of France, Britain or the United States until well into the 20th century. Why was that? For one thing, Clausewitz bucked tradition by refusing to write about historical examples from antiquity. While most military authors waxed eloquently about the battles of Cannae, Thermopylae and Agincourt, Clausewitz felt, correctly I believe, that it is useless to take military lessons from battles so long ago because the tactics and technology of those days were very different from our own. For another thing, Clausewitz wrote far more at length about the defense, praising the defense as an excellent way to buy time and attrit the enemy before wearing him down enough to take the initiative in the attack. In most militaries of the 19th Century such thinking was heresy. The attack was the decisive form of battle, and it took on the aspect of almost a religion among military planners. These thinkers would scoff at the tendency of Clausewitz to praise the defense and discuss it at such great length. Finally, Clausewitz discussed the goal of a military campaign, not to take the enemy's capital, some key fortification or some key terrain feature, but rather to attack the enemy's "Center of Gravity". This concept applied to whatever it was that drove the enemy's military strength. In most cases this would be his forces, but perhaps it could be his ideology or perhaps even his leaders. Again, such thinking was scoffed by military thinkers who were sure that their objective must be some fixed location on the map. It was only in the wars of the 20th Century that we have learned how even an insignificant place like Stalingrad or Omaha Beach could be so decisive in war. This particular edition of "On War" is undoubtedly the best one out there. The introduction gives the reader a great background on Clausewitz and the world in which he lived. Since most of us are relatively unfamiliar with the wars of Fredrick the Great, or the wars of the French Revolution and Napolean, this insight is invaluable. 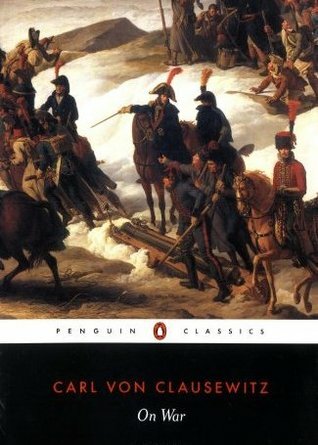 Reading this really made me want to understand better the Napoleanic era about which Clausewitz writes. Another thing that fascinated me about this book is how similar Clausewitz's view of war was to the view of Adam Smith concerning the economy. Whereas Smith spelled out the key components of the economy as land, labor, capital, transportation and entrepreneurial ability, Clausewitz discusses the five great elements of military success as the terrain, the troops, the weapons, maneuver and generalship. It would be fascinating to compare and contrast these similarities, especially since military theory has in recent years become so much in vogue among Corporate executives. This is one of those classics that I've read sections of, read discussions of, read debates about, but hadn't actually read from cover to cover. Until this year. First, a couple of notes about this edition. Goodreads has (at this writing) the wrong total page count for the book. My copy, at least, has 936 pages. Also, a fascinating element of having the Graham translation (with his footnotes) as edited by Maude (with his footnotes) is that you get glimpses of how this was taken in the late 1800s This is one of those classics that I've read sections of, read discussions of, read debates about, but hadn't actually read from cover to cover. Until this year. First, a couple of notes about this edition. Goodreads has (at this writing) the wrong total page count for the book. My copy, at least, has 936 pages. Also, a fascinating element of having the Graham translation (with his footnotes) as edited by Maude (with his footnotes) is that you get glimpses of how this was taken in the late 1800s and then again in the first decade of the 1900s. They've seen the Civil War, the Franco-Prussian War, the Boer War and some other odds and ends, and the interpretations are interesting. I found myself making notes on the notes. Two very annoying things about this edition: First, whoever digitized and edited the text universally changed phrases like "any time" and "some day" and "any way" and "some time" into anytime, someday, anyway and sometime. Irritating. Second, in the last appendix, the "Guide to Tactics", the paragraphs are lettered and numbered in outline mode; but there are references to some numbered list which is not in the text and not explained. We're to refer to #293, but there is no #293. So, why was this book written, and what the heck is it, anyway? you ask. Well, it's an attempt to produce a philosophical-science definition of War, along the lines of Hegel's Phenomenology of Spirit, say, or Spinoza's Ethics. There was no such modern book, in Clausewitz's day. In addition, he wants to counter the disinformation he feels has been spread by the kind of memoirs that folks like Jomini had written, full of aphorisms, but with very little specific detail about how to fight a war. (I note that Clausewitz constantly refers to the battles of Frederick the Great, but seems never to refer to his military writings, which included specific manuals.) There was a belief, in his time (and influenced by Napoleon's campaigns) that the attack was the stronger mode of fighting. Clausewitz understood that the defense wins, but also that the defense must turn to counterattack to do anything permanent, most of the time. There were also some very odd ideas that had been turned into idiotic doctrines (like it was important to seize the highest ground around (like the Alps), whether or not they could be fought upon) and he was eager to shoot them all down. Now I know what that means, but really?? Switzerland must be left to its own forces. If it remains neutral it forms a good point d'appui on the Upper Rhine; if it is attacked by France, let her stand up for herself, which in more than one respect she is very well able to do. Nothing is more absurd than to attribute to Switzerland a predominant geographical influence upon events in war because it is the highest land in Europe. Such an influence only exists under certain very restricted conditions, which are not to be found here. When the French are attacked in the heart of their country they can undertake no offensive from Switzerland, either against Italy or Swabia, and, least of all, can the elevated situation of the country come into consideration as a decisive circumstance. The advantage of a country which is dominating in a strategic sense, is, in the first place, chiefly important in the defensive, and any importance which it has in the offensive may manifest itself in a single encounter. Whoever does not know this has not thought over the thing and arrived at a clear perception of it, and in case that at any future council of potentates and generals, some learned officer of the general staff should be found, who, with an anxious brow, displays such wisdom, we now declare it beforehand to be mere folly, and wish that in the same council some true Blade, some child of sound common-sense may be present who will stop his mouth. But will the modern reader learn a great deal from reading this book?? Um, no, not really. It's interesting as a historical document, as a step in military history. You can see which sections had been paid attention to by those American Civil War generals who had bothered to read him, or anything. You can see how poorly developed military theory was before the Prussian General Staff system (which Clausewitz helped create) took hold. But you won't learn much about War itself. I also decided, while reading this, that most of the debates on it that I've read have been overwrought. They have torn into this like it was intended to be Holy Writ, and the truth is it wasn't finished. So we're looking at a variety of partial drafts, and it shows. Also, he was rather clear on his own limitations. He insisted that warfare was part of public policy, and it is. He noted that sometimes war takes on a life of its own, which it does, but that this need not be the case. He observed that pure war, total war, was the essence of war, but also rather rare. These are all valid, but I've read debates that tried to pin him to a precise percentage view; and it's just not there in the text. Mostly he feels that war is complicated, and never just one thing. The element I found most interesting, is that this guy fought in both the Wars of the Revolution and the subsequent Napoleonic Wars, and he is quite clear that both were essentially a new kind of warfare. He wonders whether most wars after this will be like the Napoleonic campaigns, or whether they'll revert to the older styles. He suggests it'll be both, and one should be prepared for either. One last observation on the text. I was struck by the almost complete absence of any reference to the Classics. Caesar, Alexander, Hannibal, Thucydides, Vegetius, Xenophon, might all as well never have existed. Both the wars and the writings of the Romans and Greeks are omitted. Okay, so this is a long book--over 600 pages--and some of it is a slog--like a battle that has gone on too long, with the reader's army expending a lot of energy and time to finish. But, it can be useful. The book I mean. Even as we don't fight wars in our everyday lives, we can use this book to solve problems and conflicts. Maybe. I haven't put its advice and strategies into action yet. But, here's hoping. Among much advice, Clausewitz says war is politics by other means. He urges it to be deci Okay, so this is a long book--over 600 pages--and some of it is a slog--like a battle that has gone on too long, with the reader's army expending a lot of energy and time to finish. But, it can be useful. The book I mean. Even as we don't fight wars in our everyday lives, we can use this book to solve problems and conflicts. Maybe. I haven't put its advice and strategies into action yet. But, here's hoping. Among much advice, Clausewitz says war is politics by other means. He urges it to be decisive; you have to go all in, but, when it's being lost, you have to pull out and accept defeat, which, America hasn't really accepted in the past few decades. No matter, though this is a political book if there ever was one. The Reading Guide at the end applies what Clausewitz wrote to the 20 century American wars. Shame it was written before the conflicts in Iraq and Afghanistan. On War is often considered tedious, long, and difficult to read. Those who promote this argument certainly have some valid points, and their concerns were echoed by Clausewitz's contemporaries, which led to Antoine Henri Jomini achieving far more prominence in military circles before 1914. However, despite Jomini's continued influence in the concept of "scientific principles of war", Clausewitz's On War has proved instrumental in shaping the foundations of today's military theory and thought. An On War is often considered tedious, long, and difficult to read. Those who promote this argument certainly have some valid points, and their concerns were echoed by Clausewitz's contemporaries, which led to Antoine Henri Jomini achieving far more prominence in military circles before 1914. However, despite Jomini's continued influence in the concept of "scientific principles of war", Clausewitz's On War has proved instrumental in shaping the foundations of today's military theory and thought. Any student of military history or science, or politics, should at least read Book 1 Chapter 1 of On War. A basic understanding of Clausewitz will lead to a much enhanced understanding of both politics and war, especially in regards to historical periods after his death and the publication of this book. My advice for anyone approaching Clausewitz with one or all of many preconceptions about what he meant to say or how his influence affected military theory today: Keep in mind that Clausewitz sought only to develop a way of thinking about war. Unlike Jomini, Clausewitz often demonstrates how war is full of exceptions, and rejects Jomini's reductionist and prescriptionist approach. Even if you disagree with Clausewitz's ideas, if you thought about the nature of war and how it intersects with politics, Clausewitz has achieved his goal in writing his book. There are scores of books throughout history that have stood the test of time and remain relevant even today. To Clausewitz's credit, "On War" is one of them. Unfortunately, while Clausewitz's observations may be timeless, his writing style and voice are horribly out of date. His treatise is obtuse, repetitive, and rife with long-winded, complicated sentences. It is true that he was a soldier and not a writer, and that his holistic view of war has shaped the manner in which armed conflict is cond There are scores of books throughout history that have stood the test of time and remain relevant even today. To Clausewitz's credit, "On War" is one of them. Unfortunately, while Clausewitz's observations may be timeless, his writing style and voice are horribly out of date. His treatise is obtuse, repetitive, and rife with long-winded, complicated sentences. This is the other book, after "The Art of War", in the popular mind when it comes to military theory. I believe it is far superior as well. It only doesn't receive 5 stars from me because it was never finished and this results in two big setbacks: 1) The book on "The Attack" is mostly notes, with even barer concepts (Clausewitz is excellent in simplifying concepts, but in this book the lack of treatment works against that simplicity) and 2) There are important final chapters in the last book "Pl This is the other book, after "The Art of War", in the popular mind when it comes to military theory. I believe it is far superior as well. It only doesn't receive 5 stars from me because it was never finished and this results in two big setbacks: 1) The book on "The Attack" is mostly notes, with even barer concepts (Clausewitz is excellent in simplifying concepts, but in this book the lack of treatment works against that simplicity) and 2) There are important final chapters in the last book "Plan of War" that went unwritten. 1/ Are all wars evil, destructive for mankind as a whole,should and must be avoided at all costs? 2/ Should we , as a whole , be ashamed of ourselves since this evil deed became as daily occurrence? I listened to Volume 1. Carl von Clausewitz like Marcel Proust takes delight in unnecessarily complicated sentences. His style of writing isn't very suitable to the audiobook format. In the beginning he spends some time defining fundamentals and debunking bullshitters. His writing is most interesting when he uses examples to illustrate his ideas. Ultimately, I was bored too often and his remarks frequently couldn't capture my attention, 2,5 stars. Who am I to critique Clausewitz? Honestly, everything he says could be written in about 40% of the space he takes, but his kernels of truth remain so and ever shall. Worth everyone's time (especially in this abridged version, which cuts out much of the period-specific tactica on terrain and investing fortresses and the like). So, after taking a week to really chew up and digest Uncle Carl, I see how and why a lot of people get his propositions wrong! They get his theory wrong, and then mis-apply it to modern day situations without fully understanding his context. I know for a fact this week has help to make me a better military thinker for gaining a better understanding and appreciation of Clausewitz! Carl Philipp Gottlieb von Clausewitz was a Prussian soldier, military historian and military theorist. He is most famous for his military treatise Vom Kriege, translated into English as On War. Clausewitz has served in the Rhine campaign (1793–1794), when the Prussian army invaded France during the French revolution and in the Napoleonic Wars from 1806 to 1815. Clausewitz helped negotiate the Conven Carl Philipp Gottlieb von Clausewitz was a Prussian soldier, military historian and military theorist. He is most famous for his military treatise Vom Kriege, translated into English as On War.